When it comes to feeding your Maltese, seek out brands which focus on protein quality. Meat-derived protein beats out plant-derived protein every time. Aside for lean protein, Maltese also have a requirement for amino acids, healthy fats, vitamins and minerals. This breed also suffers from several other diet related health problems like juvenile hypoglycaemia and micro-vascular dysplasia, which you should look out for. To give Maltese dogs the diet that they need, seek out foods that are tailored for small dogs and consider limited ingredient diet foods that are hypoallergenic and which will help avoid some potential allergies and health problems. 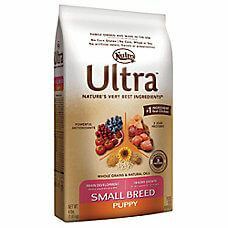 This is the best commercial dry dog food to feed a Maltese dog. It's an all LIFE Stages recipe that prevents weight gain, uses only the highest-quality ingredients, has easily digestible proteins and is rich in the all quintessential fatty acids for healthy skin and coat. Following a dog’s caloric requirements in proportion to their size is important for supporting healthy growth and functioning. Measuring a dog’s food helps them maintain a healthy weight level and get the right balance of vitamins and nutrients. Caloric requirements are outlined per dogs’ sizes, but owners can adjust this amount based on their dogs’ energy levels. When it comes to smaller breeds like the Maltese, measuring out their food is important. Maltese are one of the smallest dog breeds. They don’t eat very much in comparison to larger dogs. At two pounds, a dog requires 65 calories per pound or 130 calories a day in total. At five pounds, they require approximately 52 calories per pound and at ten pounds, they require 44 calories per pound. Once dogs reach maturity they need fewer calories than they did when they were growing puppies and senior dogs that don’t get much exercise need even fewer calories. It is recommended that owners feed their Maltese, who are prone to digestive issues, high quality dog food. This food should not contain any fillers like corn, gluten, or meat by-products. Maltese do best on a diet that consists of high-quality protein, fruits, and vegetables. Some owners may choose to feed their Maltese homemade meals if their Maltese is especially sensitive. Owners can always consult with a vet if they are unsure about their Maltese’s diet. It wasn’t always easy to tell what type of dog food was the best option for our furry companions. Until the 1970's, when Dr. Mark Morris launched a marketing campaign for his line of high quality pet foods, owners didn’t realize that a lot of the common dog food brands found in grocery stores were not ideal. These dog foods are commonly full of unhealthy fillers with very little in the way of natural ingredients. Hill’s Pet Foods started the trend of offering dog foods exclusively through vet clinics and helped lead to the wide selection of specially formulated pet foods that we have today. Through his marketing efforts, Morris encouraged dog owners of the time to fight for more transparency from dog food brands, which is why the FDA now requires all ingredients in dog food to be labelled, as well as the percentages of its main ingredients. To support the growth of healthy bones, brain, and muscles, puppies need a diet that is higher in protein and carbohydrates. They also need to be fed more often, usually around 3 or 4 times a day. This is even more important for Maltese, who often suffer from juvenile hypoglycemia, or low blood sugar in puppies. Feeding them up to four times a day until they are 6 months old will help give them enough sugar and nutrients they need to keep them going throughout the day. Maltese puppies love to run and play, so frequent feedings will help them sustain that happy energy. It is recommended that puppies be fed a consistent amount of the same food at the same times every day to ensure that they are getting the proper nutrition that they need for proper growth and bodily functioning. Unless there is a problem with their food, owners should also keep them on the same brand and formula. AAFCO recommends that puppies’ food contain 22% protein and 8% fat content to support healthy growth. Maltese tend to reach maturity at around 8 to 10 months of age, which is when owners should start to adjust their diet. 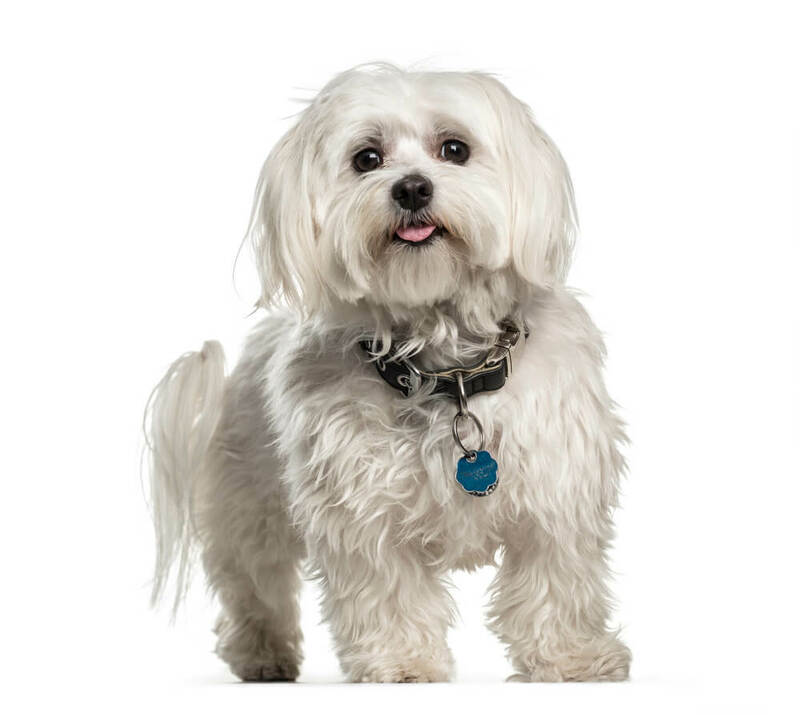 Adult Maltese need less protein in their diet, but approximately half of their calories should still come from carbohydrates to support this small dog’s high energy levels. Most adult dogs do well when fed once or twice a day, including Maltese. Dogs that have exceptionally high activity levels should have increased fat in their diets because it helps them metabolise important ingredients like vitamins and nutrients. AAFCO recommends that an adult Maltese’s food contain 18% protein and 5% fat. Owners should keep their dog’s food consistent once they settle on an adult formula. If an owner went with an all-stages formula for their puppies, they will only have to adjust the amount as their Maltese grows. If a Maltese’s food is high-quality and holistic, all they will need to support their diet is a consistent supply of fresh, clean water. As a Maltese gets older, their diet should consist of less protein because high protein levels in an inactive dog can lead to kidney problems. Older dogs also need to be fed less to avoid excess weight gain, which can lead to a host of health problems and even early death. If you can place both hands around a dog’s midsection and can’t feel their ribs, it is a good indication that they may be overweight. Owners should keep their Maltese’s diet as consistent as possible as they enter their senior years, making small adjustments whenever it is necessary. There are many options available for dogs who are overweight or who have allergies and sensitivities. Special formulated dog diets help take out troublesome ingredients like grain, dairy, and chicken and get dogs back on track with their nutrition. Owners looking for food to help their dogs lose weight should find recipes that contain above average protein, below average fat, and below average calories. When it comes to allergies and sensitivities, owners should find limited ingredient dog foods with unique sources of carbs and protein. Fromm Four-Star Nutritionals is a high-quality dog food brand operating out of Wisconsin that meets the nutritional levels established by AAFCO’s Dog Food Nutrient Profiles for all life stages. This particular blend is grain-free and uses fresh wild salmon and tuna as a lean protein source for smaller dogs who are less active or who are looking to lose weight. Some of the great ingredients included in this dog food recipe are a medley of Mediterranean garden vegetables such as are fresh tomatoes, spinach, zucchini, carrots, eggplant and olive oil, along with a plethora of added minerals and vitamins to give dogs complete nutrition. Chicory root extract is included in this blend to help with dogs’ digestion, while flaxseed and salmon meal make up some of the recipe’s Omega 3 and 6 fatty acids to give dogs healthy skin and a shiny coat. It has 408 kcal/cup. This formula by Fromm Four-Star has 408 kcals per cup and contains 28% minimum crude protein, 16% minimum crude fat and 3.5% crude fiber which is really impressive. Owners should be aware that this dog food contains ingredients like eggs and dairy, which some dogs maybe allergic to. 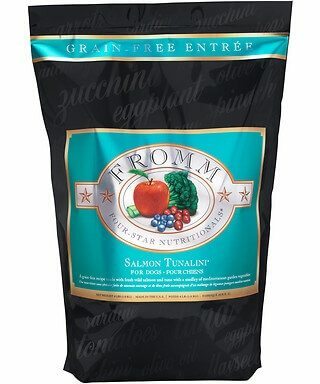 Fromm Four Star Salmon Tunalini is an all life stages dog food so it suitable for puppies, adults and senior dogs. Overall this a highly rated grain free brand which will have your Maltese pupster tail wag while licking their bowls clean! Blue Buffalo is a dry dog food brand that believes if we love our dogs like family, we should feed them like family. Their Lamb and Brown Rice formula provides small breeds like the Maltese with holistic nutrition that is formulated with more protein and carbohydrates to support their high-energy levels. Blue Buffalo’s small breed dry dog food is also made with BLUE’s unique “small-bite” kibble that is perfect for little mouths to chew and shaped to help with tartar removal. This is great for Maltese, who commonly suffer from teeth and gum problems. This USA-made dog food is made with great ingredients like tasty deboned lamb, whole grain rice, barley, and oats, along with whole fruits and vegetables to provide small dogs with balanced nutrition. 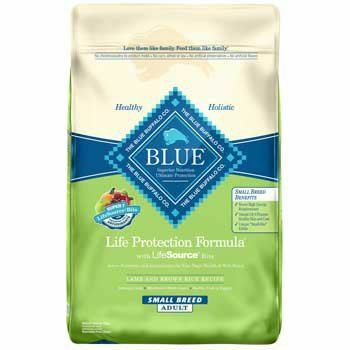 Like all of BLUE’s dry dog food blends, their small breed formula contains specially formulated LifeSource Bits containing vitamins, minerals, and antioxidants to support a healthy immune system. These LifeSource Bits contain superfoods like apples, blueberries, cranberries, pumpkin, and spinach. Flaxseed is included in this recipe as a source of healthy Omega 3 and 6 fatty acids to provide dogs with healthy skin and a shiny coat, while glucosamine is used to support dogs’ joint health. Blue Buffalo doesn’t contain any chicken or poultry by-product meals, corn, wheat, soy, and artificial flavors or preservatives. 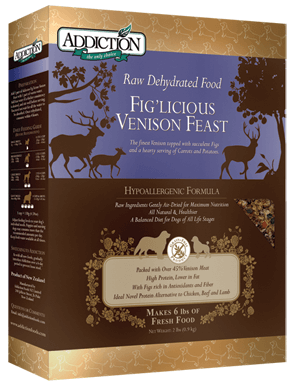 Fig'licious is a specially formulated raw dehydrated, hypoallergenic dog food that is made with an impressive 45% venison as its unique source of protein. This high-protein, low fat dog food that is good for dogs in all life stages, is perfect for Maltese who often need a steady specialized diet to defend against common health issues. This all-natural dog food is a great grain-free option that includes antioxidant and fiber-rich figs, carrots, and potatoes as some of its main ingredients. Dehydrating raw ingredients for dog food is a new method that retains more of the ingredients’ nutrition than canned and dry dog food. It also takes away moisture that can lead to spoilage and the growth of microorganisms in dogs’ food. Addiction Pet Foods is great for picky pups and dogs who are allergic to common protein sources like chicken, lamb, and beef. Addiction prides itself on providing dogs with superior nutrition using only healthy ingredients, with no harmful additives, fillers, and preservatives that are common in grocery store dog food brands. This dog food might cost a little bit more than dry dog food options but many picky dogs love it, and it offers complete nutrition for all-life-stages. Owners who have dogs with difficult allergies have seen improvements in their dogs’ symptoms after switching to this brand. We can see why owners rave about this brand of dog food, it's both meaty and tasty without compromising on nutrition. Wellness Wet Canned dog food takes the guesswork out of feeding a Maltese by giving owners meals that are formulated to give dogs complete and balanced nutrition every day. Wellness only uses premium natural ingredients that owners can trust, like lamb, sweet potato, whitefish, barley, and carrots. Flaxseed is included as a source of Omega 3 and 6 fatty acids in this canned food, which contributes to healthy skin and a shiny coat. Wellness Wet Food doesn’t contain any meat by-products, fillers, wheat, corn, soy, or artificial flavors, colors, and preservatives. This food is formulated for adult dogs over one year and is a natural way to increase dogs’ moisture intake. Wellness is backed by a company guarantee to maintain these five signs of wellness: skin and coat, digestive health, eyes, teeth and gums, energy, and immunity. Using real New Zealand lamb, this recipe is suitable for dogs with gastrointestinal issues. It contains 8% minimum crude protein, 8% minimum crude fat, and 1% minimum fiber, with 549 kcal/12.5 oz can. That is low protein, high fat, and low fiber compared to most dry adult dog foods. 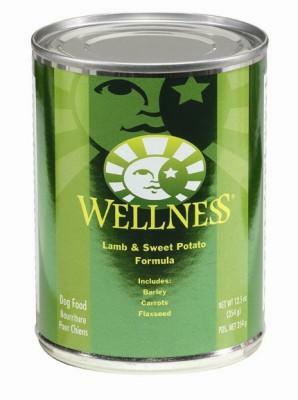 This lamb and sweet potato recipe canned dog food also contains a good assortment of vitamins and minerals essential for healthy skin and coat. 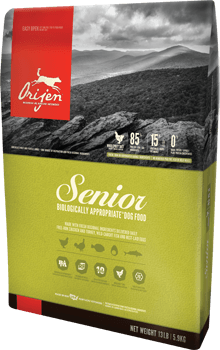 Orijen Senior dry dog food is a great option for owners who want to make sure that their dog is getting biologically appropriate nutrition that suits their changing needs as they age. Owners can rest assured knowing that Orijen is made in Canada using only fresh regional ingredients that are never outsourced. Orijen is packed with 85% poultry, fish, and egg ingredients and 15% fruits, vegetables, and botanicals. This is a limited ingredient formula with one single protein which is a great food option f​or older and more sensitive Maltese dogs. The first three ingredients are meat sources which is a good measure of the quality indication of this dog food - deboned chicken, deboned turkey and yellowtail flounder. This recipe is grain-free and limited in carbohydrates, which helps dogs maintain their weight as their energy levels start to drop in old age. Orijen Senior doesn’t contain potato, tapioca, or plant protein concentrates. Some of the other great ingredients included in this dry dog food for seniors are carrots, apples, kale, spinach, pumpkin, cranberries, and blueberries. All in all, Orijen Senior contains 38% minimum crude protein, 15% minimum fat content, and 8% maximum crude fiber. The fat and fiber contents seem a little bit high. This recipe includes glucosamine and chondroitin, which are included to support dogs’ joint health along with calcium and phosphorus to maintain healthy bones. Chicory root is used because it is good for supporting healthy digestion. Fish ingredients make up this recipe’s source of healthy Omega fatty acids to support dogs’ skin and coat. Solid Gold has been in the business of holistic pet nutrition for 40 years and offers a special formula made to support the unique needs of small breed dogs in all life stages. Wee Bit is made with real, flavorful bison as its first ingredient and healthy fats to support good digestion. This recipe (Solid Gold Wee Bit Bison & Brown Rice Recipe with Pearled Barley) is formulated into small kibble that is easy for little dogs to eat and is packed with the essential nutrients they need to be healthy and active. Along with bison as a great unique protein source, Wee Bit contains brown rice as carbohydrates to support small dogs’ high energy needs and 20 superfoods for lifelong health. This holistic dog food is a great option that owners can feed to their dogs on its own and know that they are getting everything they need. All owners need to do is make sure they feed their dogs according to the instructions and make sure they have fresh, clean water. Some of the other great ingredients that made up this recipe are cranberries, pumpkin, blueberries, carrots, broccoli, almond oil, and kelp. 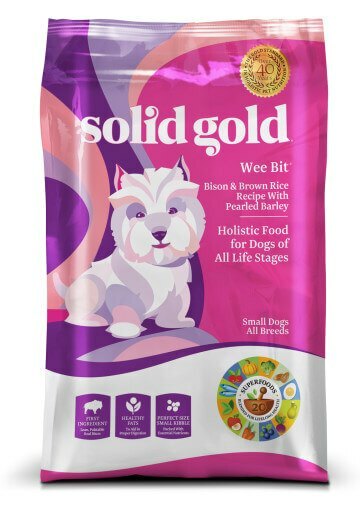 Solid Gold Wee Bit doesn’t contain ingredients that commonly trigger allergies in small dogs, such as corn, wheat, soy, or potatoes. All of Solid Gold’s high-quality animal protein is sustainably sourced from North America, Europe, and Australia. This small dry kibble food makes for an excellent choice of nutrition for Maltese puppies and has some great rave reviews from Amazon. Wellness Brand offers complete health options for small breed puppies that are specially formulated to support healthy growth and functioning at this critical time in a dog’s development. Wellness is made in the USA using only the finest ingredients, like the deboned turkey, oatmeal, and salmon meal found in their puppy recipe. This formula also uses smaller kibble that is easy for small breeds to eat. This formula (Wellness Complete Health Puppy Deboned Chicken, Oatmeal & Salmon Meal Recipe) is supplemented with a natural source of DHA to help with healthy brain and eye development and guaranteed levels of calcium and phosphorus for healthy bones and muscles. High-quality proteins, select fats, and easy to digest carbs make up the required building blocks for healthy dog growth and to support small dogs’ high energy levels. Like other Wellness dry dog foods, Wellness Complete Health for small breed puppies is all natural and doesn’t contain any wheat, corn, soy, meat by-products, or artificial flavors, colors, and preservatives. 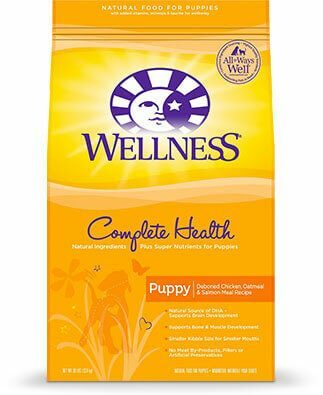 Wellness brand puppy food is USA-made and backed by a Wellness Satisfaction Guarantee. If owners aren’t satisfied they can return the unused portion with a receipt for a full refund. Nutro is a family run dog food company who makes all of their products in the USA. Nutro Ultra Puppy food uses only the best natural ingredients with no corn, gluten, wheat, soy, or artificial colors, flavors, or preservatives. The number one ingredient in this formula is real chicken as its main source of lean protein, along with lamb and salmon as sources of important amino acids for healthy muscle development. Nutro Ultra’s small breed recipe includes a special blend of minerals high in DHA to support puppy’s brain development, too. A few other great ingredients included in this recipe are blueberries, pomegranate, cranberries, tomato, pumpkin, and brown rice. Sunflower oil and flaxseed make up two great sources of Omega 3 and 6 fatty acids, which will help puppies’ skin and coats stay shiny and healthy. Nutro Small-Breed Puppy contains 29% minimum crude protein, 16% minimum crude fat, and 4% crude fiber. It also uses glucosamine and chondroitin to help puppies grow strong, healthy joints. This is a good mix for a young puppy who needs a diet high in fats and carbohydrates to be strong, healthy, and full of energy. This recipe contains 470 kcals per cup. Overall another healthy and tasty dry food for Maltese puppies. As mentioned throughout this article, the Maltese breed can suffer from a wide range of health problems. Most Maltese can live long and happy lives if their owners understand these health problems and know to adjust their dogs’ diets accordingly. For example, Maltese puppies should be fed 4 times a day until they are 6 months because juvenile hypoglycaemia (low blood sugar) is common in Maltese puppies and this helps them maintain their sugar levels. Maltese have a history of digestive issues so owners should buy their Maltese high quality food without corn, gluten, and other by-products. Maltese are also known for suffering from teeth and gum problems, eye infections, liver problems, and low thyroid. Some small breed dry dog kibbles are specially made to support dog’s teeth and gums. Inflammatory Bowel Disease is also common in Maltese. This condition results in symptoms like diarrhea, vomiting, mucous or blood in the dog’s stool, fever, and weight loss. For IBD, most vets recommend a low fat, gluten-free diet and suggest that owners avoid grains like oats, wheat, barley, and rye. Limited Ingredient Diets are also a good way to avoid triggering a Maltese’s digestive issues. Micro-vascular dysplasia is a liver disorder that affects the Maltese breed. Although micro-vascular dysplasia is common in Maltese, many of these dogs don’t show symptoms and can live normal, long, happy lives. Others show digestive symptoms like diarrhea, constipation, vomiting, and weight loss. These dogs will require a low protein diet and likely be prescribed a drug treatment by their vet. So, What's the Best Food For Maltese Dogs? Maltese are cute little companions that have stolen many hearts. The Maltese breed make great lap dogs, who can be healthy and happy with the right diet and a little exercise. Owners need to be aware that this breed suffers from a few diet-related health issues, but otherwise they shouldn’t have problems with their Maltese. High-quality dog food brands like Wellness, Nutro, Solid Gold and Orijen offers dogs holistic solutions that provide them with complete nutrition and avoid some of the ingredients that may trigger problems in a Maltese, like corn or gluten.